Sohu.com Inc reported a 37 percent increase in second-quarter net profit, lifted by a strong rise of its online gaming and brand advertising revenues. Portal sees the chance to best rival Google in the near future, chairman says. 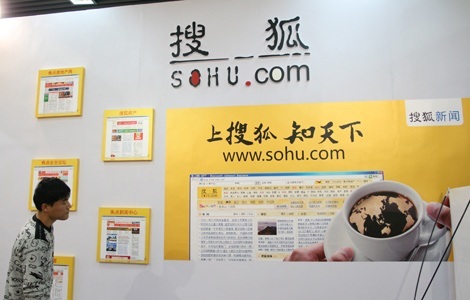 Portal Sohu.com Inc aims to surpass rival Google Inc in China's search market "in the near future", said a top executive, as the US company loses share in the world's largest Internet market. Charles Zhang, Sohu chairman, said that he expected the company's online search arm, Sogou, to break even next year and overtake Google in market share for online search traffic. "Sogou has attained initial success after several years of development and will become China's second-most-popular search engine with such momentum," Zhang said at a media briefing on Monday. Sogou, which was spun off from the portal last year, reported second-quarter revenue of $13.6 million, up more than 250 percent, according to Sohu's financial results. Zhang said Sogou's revenue is expected to reach $16 million next quarter. The search engine is losing about $3 million each quarter at present, he added. Sohu has been vocal about its ambition to overtake Google since the US search engine shut down its Chinese Google.cn service and redirected its mainland traffic to Hong Kong last year. Google has since lost market share to Chinese competitors including Tencent Holdings Ltd and NetEase.com Inc.
Google had its best time in China in the fourth quarter of 2009 with a market share of 35.9 percent. However, its share fell to 18.9 percent last quarter, while Baidu Inc claimed 75.9 percent, according to domestic research company Analysys International. Sogou had just 2.4 percent last quarter. Last month, another rival - Microsoft Corp - entered into a cooperation agreement with Baidu to provide English-language results from its Bing search engine on Baidu. Zhang Yaqin, Microsoft's corporate vice-president, said in an interview with China Daily that the move would help the Bing business "get better and better" in China. To boost Sogou's development, Zhang said the unit would seek a public listing, though he didn't give a timetable. He added that the plan was "not influenced by US investors' current cooling down of enthusiasm for Chinese concept stocks". Sohu reported a 37 percent increase in second-quarter net profit, lifted by a strong rise of its online gaming and brand advertising revenues. Net income was $42.7 million, compared with $31.3 million a year earlier, said the company's financial report.